Description The RapidNet Fibre LC Cassette to LC Cassette is pre-terminated offering LC connectivity in either single mode or multimode. The RapidNet LC Cassette presents 24 ports in one cassette, which enables up to 96 fibres in 1U of rack space, with 4 cassettes fitting into a RapidNet Patch Panel. The RapidNet LC Cassette to LC Cassette solution has been designed to support a wide range of applications including data centres, campus connectivity and disaster recovery sites providing reduced installation times, efficient use of space and high performance. Technical Description The LC cassette offers up to 24 ports in one cassette and is manufactured with a single push clip mechanism and polarising clips to prevent incorrect insertion. 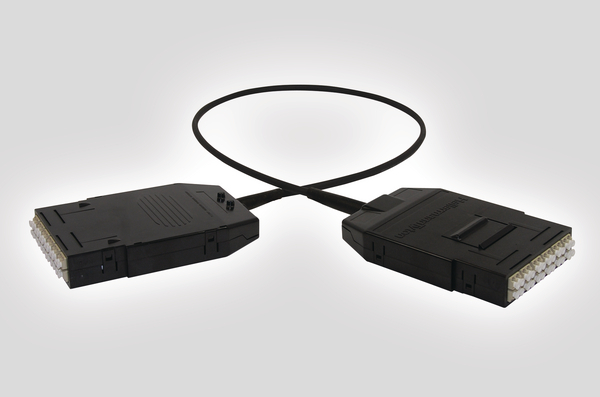 Fibre Optic management is provided within the RapidNet Cassette with integral strain relief which provides protection to all the cables and their terminations. The individual fibres within the cassette are managed using positive bend radius management to ensure minimum losses and maximum performance. All RapidNet terminations are tested to exceed the latest published versions of ISO/IEC 11801, BS/EN50173 and ANSI/TIA/EIA 568 – C standards. NB. Part Numbers given are for a 10m loom as an example. Other lengths are available on request that meet the maximum distance performances defined in the latest published versions of ISO/IEC 11801, BS/EN50173 and ANSI/TIA/EIA 568 – C.